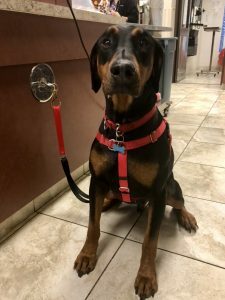 Legend is a 2 year old male neutered doberman mix. He was recently adopted by his new family who did not know of his counter surfing bad habits. The owner’s left the kitchen for a brief period of time. When the owner came back in the kitchen, Legend had helped himself to a whole loaf of raisin bread. The owners knowing the risk, rushed Legend to the ER within 30 minutes of ingestion. Many people know that grapes are very toxic to dogs but what people forget is that raisins are dehydrated grapes. The toxic component of grapes and raisins is vitis vinifera. These potentially hazardous fruits cause renal failure if left untreated. Dogs, ferrets, and cats are the only species that this toxicity has been reported in. Like any toxicity, the dose and the size of the animal determines the toxic effects. The second concern with Legend’s huge appetite is the concern for bloat. There are two types of bloat in dogs. The first type we are concerned about is food bloat. This is when a dog gorges themselves on a large meal in a short period of time. Food bloat is typically not life threatening but may require veterinary intervention. The concern with food bloat is pain from distended stomach, possible vomiting, diarrhea, decreased gastric emptying, and pancreatitis. The second type of bloat known as a GDV (gastric dilatation volvulus), which is life threatening. This is when the stomach progressively distends and then rotates abnormally on itself. This gastric (stomach) torsion prevents outflow of fluid and food. It can cut off blood supply to vital organs and it can cause splenic damage. GDVs are more common in deep chested breeds such as great danes, dobermans, german shepards, laboradors, greyhounds and golden retrievers. Signs vary but not limited to excessive drooling, non productive vomiting, restlessness, panting, and painful, distended abdomen. This requires immediate veterinary attention and surgical intervention. But do not stress! Dogs can have a preventative elective procedure called a Gastropexy, which can reduce the risk of a GDV. Talk with your veterinarian to discuss further details to see if your pet is a candidate! But what about Legend you wonder? Well the good news is because Legend’s owners knew the risk they rushed him to the Emergency Room right away, we were able to induce vomiting. The cinammon raisin loaf was vomited up in whole slices. None of the raisins were digested yet by the stomach and food bloat was avoided. He was then given an injection to settle the stomach and the owners took him home to monitor. If Legend’s parents had not acted so quickly, they could have been dealing with kidney failure or a potential fatal GDV. Legend is back at home and the owners no longer leave him unsupervised in the kitchen.